Can You Help Me Count All The Stars? Why wait for bed to gaze at the stars? Feast your eyes on some of the glorious starscapes on display here! It seems it might be a tad better place to starwatch from outer space than having your feet firmly planted on our ground. Thanks to iO9 for the tip! WikiSky is an incredible site. Look at comets, stars, the whole shebang; move your cursor over them and see what they are named. Pick one and make it yours. 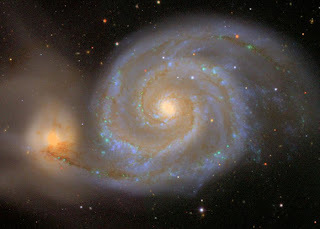 Or check out this site for some incredible photographs like the one featured here of Messier 51, aka The Whirlpool Galaxy.